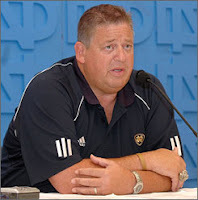 By losing to Michigan State today Charlie Weis took the program to a new level... low level that is. For the first time in school history, 119 years of playing football, the program is 0-4. Unbelievable! Despite some good looking drives in the first half the boys just couldn't hang with the Spartans and were man-handled in the third and fourth quarters. Weis doesn't know what to do and I'm not sure what can be done. I can say this - Weis may not be the hero he was herald to be a few years ago. Although the dial on the stove will be moving slowly... the heat is coming. One thing that really bothers me about Weis is his mouth. If you watch a game you can't help but pick up on his nasty language. Now you may say that this is "big time" football; however I would assert that the University of Notre Dame deserves a couch that can communicate without using profanity. Last year when the program was cruising along Weis was featured on 60 Minutes and in the first 90 seconds of the piece you get a glimpse of Charlie's vocabulary. Potty mouth. Well that may be normal in college football, but I bet I could find a number of successful coaches that don't speak to players, coaches and referees without dropping the F-Bomb. Anyway I'm frustrated and I'm blaming the coach. Let's see what this week brings Charlie Weis. "Irish Eyes are NOT Smiling." That's the exact title of a post I wrote over the weekend (see below) on the state of Notre Dame football of which I am a huge fan. You can imagine my shock that USA Today would steal MY headline. Although they lifted the title they failed to grab the premise of my post, which is that Charlie Weis could be in a huge hole by the time the leaves start to turn in South Bend and little ones come begging at your door for candy. 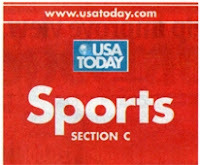 We'll see how things turn out for Chuck - but shame on you USA Today. Come up with your own headlines! Have you ever been on an airplane and noticed the advertisements for the Karrass Negotiation Seminars? A few years back I had seen the piece so many times I decided to check it out and signed up for a class in Phoenix. It was about a grand and lasted two days. I came away with two keys pieces of information that I use every day and will never forget. 1. Everything is NOT negotiable and 2. Win-Win is not a cliche, every successful negotiation, that will stand the test of time must have a win-win component. That's what's missing in the American political debate. Both parties, and their fringe groups, want to engage in win-lose negotiation. When that's apparent in debate, the opposing side will always dig in their heels. Now we have some very well educated individuals running our congress so why haven't they applied the simple truths of a Karrass seminar? To make the climate as hostile as possible the fringe groups who are willing to fight and demonstrate for their minority causes speak with a loud voice. Throw money behind a group like that and you have a monster that no politician can overcome. Rather than fight they embrace the monster - then become dependent on them for survival. Win-Win negotiation requires that both parties are willing to let the other win - or at least feel as if they have won. This requires diplomacy, tact and a willingness to see the other persons point of view. None of this is happening in US politics. The next person to enter the White House and hopefully the leadership positions in the congress need to attend a Karrass Negotiating event. Check them out at http://www.karrass.com/. There is nothing Charlie Weis can say that will explain away the dismal 0-3 start the Irish have posted so far this year. Not only are they losing games, they just look like crap. Jimmy Clausen isn't going to solve the challenges you see on the line, in the backfield or anywhere else. The hype Clausen brought to the program ended last week when he lost for the first time in four plus years of stepping on a football field. I'm an Irish fan because I love the tradition of the program and the passion of the fans. The same emotion that makes ND fans exciting makes them demanding. My gut tells me that Charlie is only a loss away from being questioned in the media and questioned by the alumni. I understand rebuilding a program (that's what I've been telling the people yanking my chain), but five fumbles? Let's get it together men. Charlie you better figure something out quick - your record this season has you in the same league as Bob Davie... 0-3. I should say so, before leaving for his mission Olson was a member of the BYU football team. 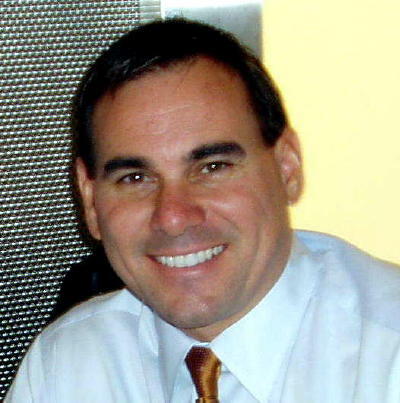 Upon gaining much wisdom, and maturing mentally, he returned from his mission and quickly transferred from BYU to UCLA. Was it a good decision... UCLA 27 BYU 17. Ready to Get Serious about Terrorism? I've been direct about my position on our troops fighting in Iraq, and the unique challenges there that make it almost necessary to fight the right way or get the hell out of the country. "It has now become clear to you and the entire world the impotence of the democratic system and how it plays with the interests of the peoples and their blood by sacrificing soldiers and populations to achieve the interests of the major corporations." The assumption being that our country and the freedom we enjoy now needs to come to an end... so either Islamic insurgents will defeat us in Iraq and around the world or we can simply all become Muslims and start saying our prayers five-times a day. Right. This joker and what he's not joking about should have every able bodied individual in this country ready and willing to grab a weapon and defend ourselves against radical Muslims. If this tape doesn't get the liberals in congress attention I don't know what will. 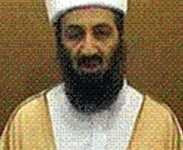 Bin-Wacko isn't thinking or saying anything today he wasn't thinking or saying pre 9/11. He's just been putting his money where his mouth is with the absolute conviction we won't do anything to stop him. What will stop him and his Islamofascist followers? The United States of America and a full-court press against him. United and full-court implies our elected officials stop politicizing this threat and start working together.